NoFrack Mountain’s ten year old computer finally passed away on 9/12/10. Therefore, I will only be able to post when I can steal some time on other computers until I find an affordable replacement. Thanks for all your prayers. Dell will be missed. In the mean time, explore the new and improved www.GDACoalition.org website. It was crafted by Duke Barrett and is light years more advanced than the blog I did for GDAC. Thanks Duke! 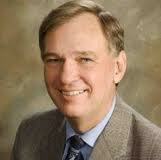 Hello, this is Pennsylvania DEP Secretary John Hanger inviting you to vacation here in Pennsylvania. There are so many things to do in the Champagne State: Take an intoxicating and romantic trip down the bubbly Susquehanna. Milk a dead cow! Come visit one of our many new and exciting theme parks such as Cabot Patch or EnCana Land! Remember, liberty began and ended right here in Penn’s Woods. See you soon! Ho-Hum: Just Another Little Old Pipe Line Explosion… what’s for dinner? * 1969: High pressure natural gas pipeline. A 14-inch (360 mm) natural gas pipeline running at 789 psi near Houston, Texas ruptures, causing a massive fire. Construction work downstream of the accident lead to a pressure build up that caused the rupture. September 9, 1969. * 1970: Colonial Pipeline Company, petroleum products pipeline, Jacksonville, Maryland, (September 3, 1970. * 1989 Petroleum products pipeline failure after the San Bernardino train disaster, California. Damage from derailment cleanup caused petroleum products pipelines to rupture, spraying homes with gasoline. Three killed in following fire. * 1989 New York City Con Edison Steam Pipe explosion, rupture 3 are killed in the 3rd ave- Grammercy Park area. * 1990 Propane pipeline rupture and fire, North Blenheim, New York, March 13, 1990. Stress from previous work done on a pipeline causes rupture, vapor cloud moved downhill into a town. 2 killed and numerous buildings destroyed when the cloud ignited. * 1993 On Sunday, March 28 at 8:48, a pressurized 36-inch-diameter (910 mm) petroleum product pipeline owned and operated by Colonial Pipeline Company ruptured near Hemdon, Virginia. The rupture created a geyser which sprayed diesel fuel over 75 feet into the air, coating overhead powerlines and adjacent trees, and misting adjacent Virginia Electric Power Company buildings. The diesel fuel spewed from the rupture into an adjacent storm water management pond and flowed overland and through a network of storm sewer pipes before reaching Sugarland Run Creek, a tributary of the Potomac River. * 1994 Texas Eastern Transmission Corporation Natural Gas Pipeline Explosion and Fire Previous damage cause a natural gas transmission pipeline to rupture at Edison, New Jersey on March 23, 1994. * 1996 Butane Pipeline rupture and fire, near Lively, Texas, August 24, 1996. 2 killed after driving into an unseen butane cloud. Leak was caused by external corrosion. * 1997 Pipeline Rupture and Fire, Indianapolis, Indiana, July 21, 1997. * 1998 Natural Gas Explosion and Fire, South Riding, Virginia, July 7, 1998. * 1998 Natural Gas Pipeline Rupture and Subsequent Explosion, St. Cloud, Minnesota, December 11, 1998. * 1999 A pipeline in a Bellingham, Washington park leaked gasoline, vapor from the leak exploded and killed 2 10 year old boys and an 18 year old man on June 10, 1999. Issues causing the rupture were found to be previous pipe damage by excavation, incorrectly set up pressure relief valve, unexpected remote valve closure, and new software tests on the live controlling computer. * 2000 Hazardous Liquid Pipe Failure and Leak, Explorer Pipeline Company, Greenville, Texas, March 9, 2000. * 2000 Rupture of Piney Point Oil Pipeline and Release of Fuel Oil Near Chalk Point, Maryland, April 7, 2000. * 2002 Rupture of Enbridge Pipeline and Release of Crude Oil near Cohasset, Minnesota, On July 4, 2002 an Enbridge pipeline ruptured in a marsh near Cohasset, in Itasca County, spilling 6,000 barrels (~250,000 gallons) of crude oil. In an attempt to keep the oil from contaminating the Mississippi River, the Minnesota Department of Natural Resources set a controlled burn that lasted for 1 day and created a smoke plume about 1 mile high and 5 miles long. * 2003 Excavation Damage to Natural Gas Distribution Line Resulting in Explosion and Fire, Wilmington, Delaware, July 2, 2003. * 2004 On November 21, 2004, a 14-inch-diameter (360 mm) petroleum multiproduct pipeline sprung a leak that was transporting gasoline at the time of the release. The pipeline, owned and operated by the California-Nevada Pipeline Company, a subsidiary of Kinder-Morgan Energy Partners, is the main source of petroleum fuel products for Las Vegas, NV. An 80 foot geyser was discovered on the morning of November 22, 2004, after numerous complaints of a strong gasoline odor on Interstate 15 in northern San Bernardino County, CA. * 2007 On January 1, an Enbridge pipeline that runs from Superior, Wisconsin to near Whitewater, Wisconsin failed, resulting in a spill of ~50,000 gallons of crude oil onto farmland and into a drainage ditch. The same pipeline was struck by construction crews on February 2, 2007, in Rusk County, Wisconsin, spilling ~126,000 gallons of crude. Some of the oil filled a hole more than 20 feet deep and was reported to have contaminated the local water table. * 2007 A 12-inch (300 mm) propane pipeline explodes, killing two and injuring five others near Carmichael, AL on November 1, 2007. The NTSB determined the probable cause was likely ERW seam failure. Inadequate education of residents near the pipeline about how to respond to a pipeline accident was also cited as a factor in the deaths. * 2008 Natural gas pipeline explodes and catches fire on February 5, near Hartsville, TN Believed to have been caused by a tornado hitting the facility. * 2008 A gasoline release from a petroleum pipeline occurred on November 25, 2008 at a retail mall in Murrysville, PA. Officials said the release occurred from the six-inch line at about 9:30 a.m. while a Sunoco Logistics crew was working on a ball valve. .
* 2009 A rupture of pipeline near Cygnet, Ohio, owned by Philadelphia-based Sunoco Logistics Partners LP, resulted in one of the largest oil spills in Wood County history. Feb. 18, 2009. * 2009 Natural gas pipeline explodes and catches fire on May 5, 2009 near Rockville, IN in Parke County about 24 miles north of Terre haute, IN. PHMSA indicated the possibility of external corrosion in its Corrective Action Order (CAO) to the pipeline company. Pictures have been released around the area showing the damage caused. 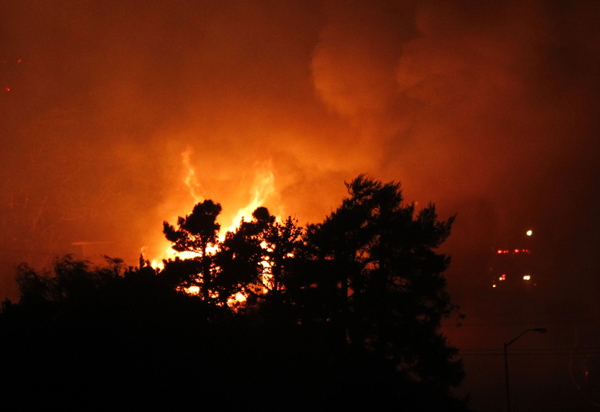 49 homes were evacuated in a one-mile area of the explosion. No injuries reported. * 2009 http://www.chron.com/disp/story.mpl/ap/tx/6707144.html reference: Bushland, Texas — Two people hurt when a natural gas pipeline exploded in the Texas Panhandle. The explosion early Thursday 5 November left a hole about 30 yards by 20 yards and close to 15 feet deep. The blast shook homes, melted window blinds and shot flames hundreds of feet into the air. The home nearest the blast — about 100 yards away- was destroyed. Bushland is about 15 miles west of Amarillo. In addition to the above list, there seems to be many more pipeline accidents out there: Just do a You Tube search for “Gas Pipeline Explosions” and you will find other examples of pipe line accidents. I am sure there are also other good sources out there. The point is: these explosions happen frequently, are often deadly and always destructive. They are a function of material failure, corrosion, human error, and random misfortune. It could just as easily happen here in NEPA. Why not? We seem to be good at making the national news for all the wrong reasons. 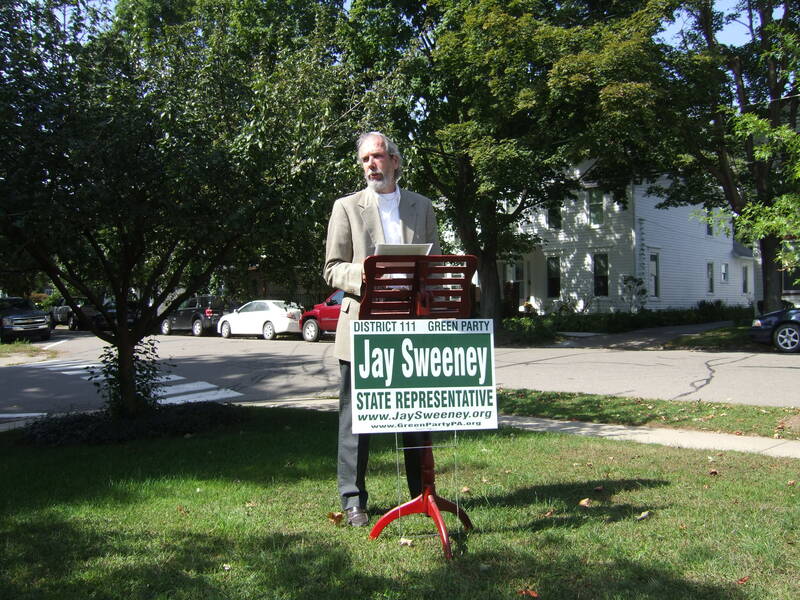 Today, on the lawn of the Wyoming County Courthouse, Mr. Jay Sweeney of Falls Township, PA announced his candidacy for Representative in the Pennsylvania General Assembly in the 111th district. Mr. Sweeney is a member of the Green Party and has campaigned previously for this seat. In 2006 he recieved 17.5% of the vote. I am here today to announce my campaign for State Representative in the 111th District. I am running first and foremost to protect our environment from the oil & gas industry. Our legislators and the Department of Environmental Protection have failed us. Drilling for natural gas is not a bridge to the future, it is a shackle to the past and will delay the implementation of a true green energy policy. Water is the bridge to the future. Without it, we won’t get there. We are being asked to sacrifice our water for natural gas. Just ask the residents of Carter Road in Dimock. The oil & gas industry has initiated a campaign to convince the public that there is a lot of misunderstanding about hydrofracking and their industry uses less water than other energy producers. In 2 years time, drilling and fracking for gas in the Marcellus Shale has resulted in unregulated water withdrawals, polluted drinking water, toxic spills, blowbacks, explosions, fish kills, injury and death to employees of the gas and oil industry. This is unacceptable! I am not opposed to people making money, but, I do believe we should protect our water at all costs. I propose a ban on fracking in the Marcellus Shale. Until we are presented with a safe means of extracting gas, I say leave it alone. I support a retroactive Severance Tax on extracted gas and oppose the use of forced pooling to allow drilling on land of those who do not wish it. I also oppose the use of eminent domain to secure pipeline passage. Gas drilling and gambling were proposed as revenue generators for the Commonwealth of Pennsylvania yet the past 2 years have seen revenue shortfalls and drastic cuts in the state budget. Unemployment is at 10%. DEP has been nearly decimated and now relies on permits from natural gas drilling for funding. This is unacceptable. Table games have been added to casinos increasing revenue to the Commonwealth. Tax payers want to know, what happened to the property tax relief we were supposed to see? Where is the gaming revenue going? This is unacceptable! The efforts of the Governor and the General Assembly to create jobs and revenue have been a failure. The General Assembly has a surplus of $300 million. This money is for the General Assembly to use at their discretion. This is unacceptable! This money should be immediately returned to the General Fund. Farming is still the largest industry in Pennsylvania, yet our farmers struggle to make ends meet. This is unacceptable! I propose a system of direct marketing for our farmers including providing for our schools and other institutions. Our dairy industry has dwindled over the past 20 years yet there are examples of successful operations including the Leraysville Cheese Factory and Mannings in nearby Lackawanna county. Organic food sales have increased by 20% per year for the last 20 years. There is a demand and people are willing to pay a premium. We must protect our farmland and water so our farmers can take advantage of this economic opportunity. Let’s put people to work providing wholesome, safe food. Tourism is another major industry in trouble. Hunting, fishing, kayaking, camping, fall foliage trips and our lovely towns such as Tunkhannock are all attractions to our area yet they are in danger due to truck traffic, woodland loss and the industrialization of our area as a result of natural gas drilling. This is unacceptable! Governor Rendell has proposed a series of new taxes on the hard working people of Pennsylvania. Meanwhile, many of the corporations operating in Pennsylvania pay no tax. This is unacceptable! I say, close the corporate tax loophole and give the residents of the Commonwealth a break. I propose a green and sustainable vision for the Commonwealth of Pennsylvania. We need to implement a 21st Century energy policy based on clean energy sources. I am not talking about natural gas, nuclear or clean coal. Let’s put people to work building and installing solar, wind, hydro-electric and geothermal systems. I propose a mass transit system to reduce some of the auto traffic and preserve our roads. We also need bike lanes on all of our roads. Let’s put people to work building and installing an efficient mass transit, bike and rail system. I propose full funding for DEP to pre 2008 levels and a Secretary who will see that our natural resources are protected for generations yet to come. I propose we support and encourage small scale manufacturing operations. We should be assisting these kind of manufacturers instead of trying to lure industry with Keystone Opportunity Zones, interest free loans and tax brakes. Let’s put people to work in small scale manufacturing operations. I support Single Payer Health Care legislation for Pennsylvania such as HB 1660. Pennsylvania should opt out of the federal health care plan which is a boon to the insurance industry at the expense of the people. Let’s put people to work in a preventative, caring health system. I support the Voters Choice Act SB 252 which would make it easier for Independent and third party candidates to get on the ballot. This bill would curtail the challenges and extortion that kept Green and Libertarian candidates for Senate and Governor off the ballot this year. Tens of thousands of voters who wanted these candidates on the ballot had the hopes dashed by the major parties. I support medical marijuana legislation proposed by Representative Cohen and I support the exploration of hemp oil as a bio fuel. 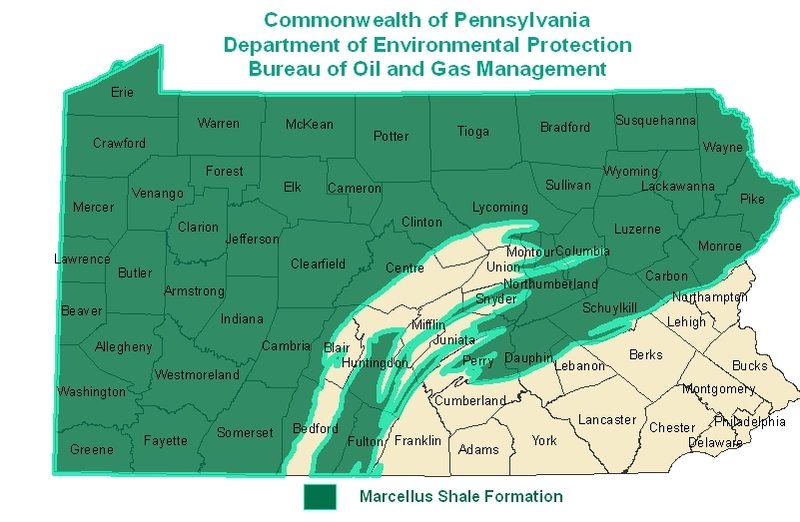 My apologies for departing from this blog’s usual theme of Marcellus exploitation. But it is a special day for me. My father would have turned ninety today. (He passed on in 1981). Everybody loved him. Not when he should have. Nor the way he should have. Nor what he should have. How Natural Gas Drilling has Changed My Eating Habits by Molly M.
I travelled to Dimock, PA, several weeks ago to see for myself what was going on at my neighbors to the north. I was astounded to see gas drilling pads in many farm pastures. On several sites, cows were being pastured and fed adjacent to the pads. I had read about cows being quarantined in Tioga County after they were suspected of drinking polluted flowback water. In Washington County cows died after exposure to drilling fluids. At Dunkard Creek, where all aquatic life died from an algae bloom caused by drilling, beef cows were photographed standing in orange-tainted water. I have decided not to eat beef any more. Every time I look at a steak, I see those cows standing next to a drill site. My new discoveries opened my eyes to other concerns. How about the farmers who were present at the farmers’ markets? Had they leased their lands? If I knew for sure they had, I bypassed their stands. I am also boycotting a restaurant next to a drill pad in Fairmount Township. I began searching for alternative food sources and discovered the joys of shopping at the Lands at Hillside. The folks who bought this wonderful farm from the old coal barons opted not to lease these lands. Hooray! Now I buy hormone-free milk, free range eggs, Hillside Gold butter, fresh ice cream, and other goodies. Life is good, and my tummy agrees. You are currently browsing the Frack Mountain blog archives for September, 2010.